From Goodreads ~ With the same eye for character, anecdote and circumstance that made Peter Ackroyd’s "London" and Colin Jones’ "Paris" so successful, Levine’s captivating prose integrates the sights, sounds and feel of Toronto with a broad historical perspective, linking the city’s present with its past through themes such as politics, transportation, public health, ethnic diversity and sports. "Toronto" invites readers to discover the city’s lively spirit over four centuries and to wander purposefully through the city’s many unique neighborhoods, where they can encounter the striking and peculiar characters who have inhabited them: the powerful and powerless, the entrepreneurs and the entertainers, and the moral and the corrupt, all of whom have contributed to Toronto’s collective identity. I've been living in Toronto almost 30 years and never tire of reading books about its history. This book starts us off in the early 1600s with Étienne Brûlé, who may have been the first European to explore the Toronto area in 1615. He had arrived in Quebec with Samuel de Champlain when he was about 16 as an indentured servant. The book ends with the embarrassment that is our current (but thankfully soon-to-be-ex) mayor, Rob Ford. The book provides a lot of information about the people and happenings over the centuries. I liked that the information was provided a high level yet there was just enough info provided. With some things, I found that I was interested enough to Google to learn more. I liked the writing style. I find that some historical books can be boring because they read like a text book ... this one didn't. Sometimes the author seemed to get gossipy about whoever he was talking about and that was fun. Some of the information was amusing. For example, back in July 1855, an American circus was in town. Some clowns got liquored up and went to a brothel. Members of the volunteer fire brigade were also there. Nasty words were exchanged and the two groups started brawling. Drunk clowns and firemen fighting ... that would have been something to see! It was appalling how racist Toronto was (I imagine most places were and unfortunately still are), especially against Jews, Blacks and Chinese. Back in the 1930s, Velma, a white woman, was dating Harry, a Chinese guy. Because of that, she was sentenced to one year in a reformatory with thieves, prostitutes and vagrants. It's a substantial book (almost 500 pages) but I didn't find it dragged. There is a section at the end of the book with a lot of pictures, plus another section with an extensive bibliography if you want to read more about a person or event. 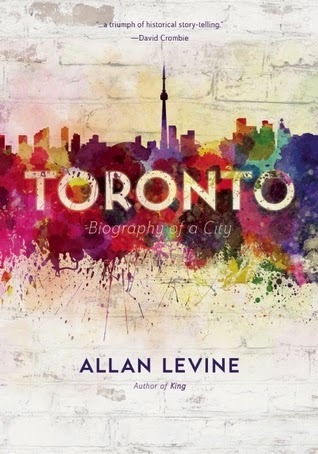 I enjoyed this book and would recommend it if you live in Toronto or if you want to learn more about our city. What an awesome book for Toronto residents! Hi, I stumbled upon your review of this book on Amazon and therefore ended up on your blog. I visited Toronto, which I dearly love, earlier in the month and saw this book on shelves at Indigo. It was too big to fit in my suitcase so I couldn't buy it then. I just bought it now on Indigo's website and can't wait to receive it (although it will be Christmas by then). Allan Levine Hi Teena. Thanks very much for the review of my book on Toronto--especially from a Torontonian. I found your review on Goodreads and posted this comment there as well.